Hawaii Native Status: Introduced. 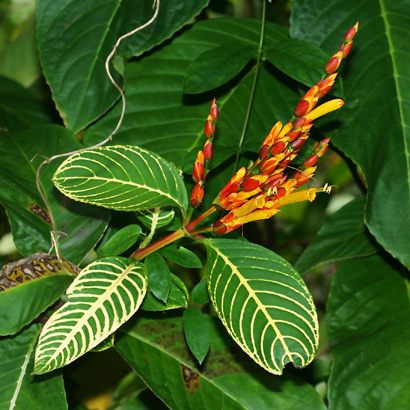 These naturalized ornamental garden plants are native to the South American tropics. Description: The flowers are in small clusters on slender flower spikes at the stem tips. Each flower cluster has a red bract at its base. The individual flowers are yellow or orange in color, tubular, 5-lobed, and have orange sepals. The flowers are only rarely followed by seed capsules. The attractive leaves are green with prominent white to yellow veins, opposite, faintly scalloped to shallowly toothed, and oval to lance-shaped. 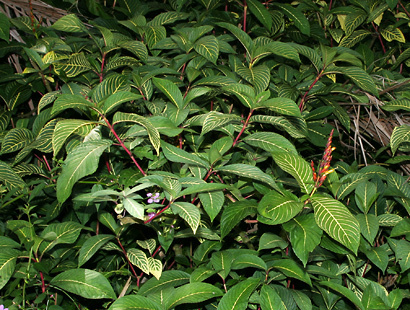 Two similar Sanchezia species are found here in Hawaii, Sanchezia parvibracteata and Sanchezia speciosa (often misidentified as Sanchezia nobilis here). Here in Hawaii, Sanchezia is cultivated and also grows wild in shady, wet to mesic (moderately wet) areas at lower elevations.